that does or doesn’t happen. The Facility Grid dashboards provide complete, real time project status. For the first time, project managers will actually know what all the issues are, what’s being done and who’s doing it, in real time. Following project status, schedules, activities and milestones, they’ll have the ability to communicate both up and down to assure expectations are met. Facility Grid quickly and clearly communicates assignments and provides all the information necessary for completion of Cx tasks. Information doesn’t get lost; it’s at your fingertips. Issues don’t fall through the cracks; they get resolved. Schedules don’t fade away; they’re closely maintained. 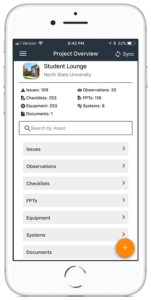 With all issues, reports and testing procedures easily accessible, managers can see what’s getting done in real time whether they’re at their desk, in a meeting, in the field, or outside work.